Home / About Fanack Water / Why Water? People need water and food. 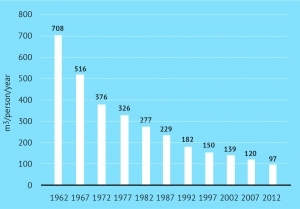 Rapid population growth in MENA – second only to that in sub-Saharan Africa – has resulted in a quadrupling of the region’s population since 1950. 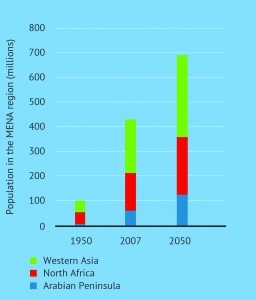 The population of the MENA is forecast to reach 700 million by 2050, surpassing the population of Europe in that year. 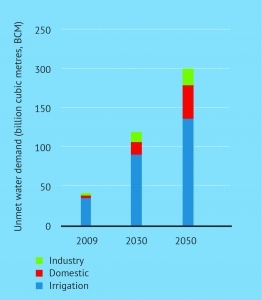 Population growth and climate change are the main drivers of a rapid increase in unmet water demand, especially in the agricultural sector. The annual amount of water available per person in the region has dropped dramatically over the past 50 years, from 2,925 m3 in 1962 to 743 m3 in 2011. This compares to the global average of 7,240 m3. Water resources are under pressure across the region. In Jordan, for example, the annual amount of water available per person has declined by 86% since 1962. The lack of water security threatens the region’s food security, with governments increasingly unable to feed their populations. 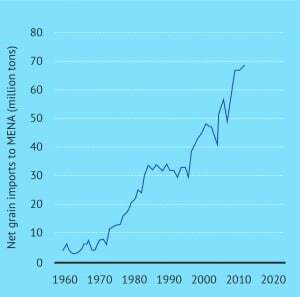 As a result, regional grain imports have more than doubled since 1990 and now account for nearly 60% of grain consumption in the region. The Lower Jordan River, which forms the border between Israel and Palestine to the west and Jordan to the east, has shrunk dramatically over the last 50 years. On the right, the Jordanian bank, on the left the Israeli bank. Impacts on the region’s environment have also been dramatic. 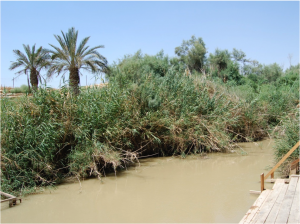 The Lower Jordan River, for example, has been reduced to 2% of its historic flow and is heavily polluted with wastewater.